On Saturday 11 August 2018, 22 students from 8 schools represented SATIS in a football game against an APS (Associated Public Schools) representative team from Victoria. The game was held at the Trinity Grammar Sports Complex in Bulleen as part of the annual APS v AGSV (Associated Grammar Schools) Winter Sports Carnival. This was the second time a representative team from SATIS has traveled interstate to play against the APS. 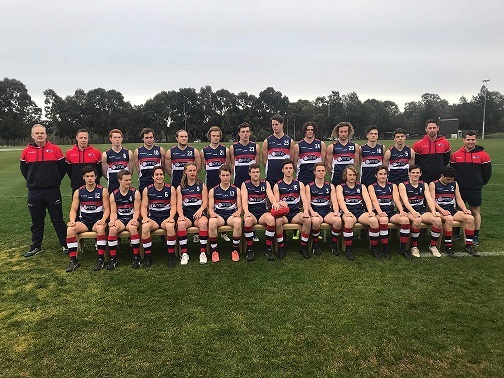 This event provided an opportunity for our students to be seen by a large number of AFL talent ID staff that attend the annual APS v AGSV game. The team was coached by Mitch Hills (SPC), Blair Brownless (GYC) and Laine Cleaver (SPC), with Adrian Finch (LCGS) as Team Manager. Fletcher Bennett (SOC) and Lachlan Gadomski (GYC) were selected as Co-Captains of the team. In what was an even contest in the first quarter, our team had a number of missed opportunities up forward while the APS team moved the ball fast and capitalised in front of goal. APS had a 4-goal lead at half time but our boys had a great third quarter, reducing their lead to one goal at the final break. APS kicked 4 goals to 1 in the last quarter, with the final score APS 12.7.79 to SATIS 7.10.52. SATIS Team: Lachie Gee, Fletcher Bennett, Ben McShane (Scotch Oakburn), James Curran, Jacob Kerr (Launceston Grammar), Oliver Sanders, Ethan Conway, Jackson Callow, Jack Lanham (St Patrick’s College), Charlie Castles (St Brendan-Shaw), Harry McIvor (Marist Regional College), Tom Reeves, Oliver Burrows-Cheng, Angus Evans, Luke Paton, Hamish Allan (Hutchins), Lachlan Gadomski, Harry Burgess, Luke Swinton, Jacob Banks, Patrick Kelly (Guilford Young College), Harry Joyce (The Friends School).